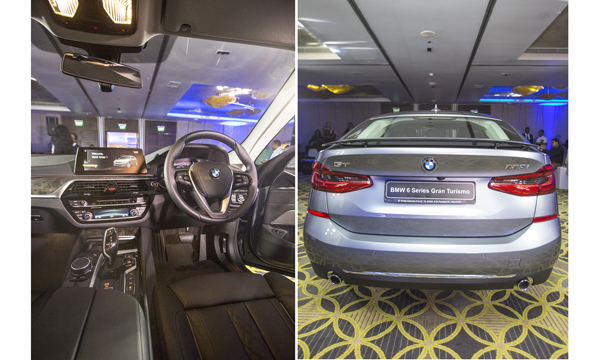 BMW Asia and Prestige Automobile (Pvt) Ltd., the sole authorised importer and distributor of BMW vehicles in Sri Lanka, launched the first-ever BMW 6 Series Gran Turismo (GT), which combines the long-distance comfort of a luxury sedan with the aesthetic appeal of a coupe, at an event held at the Hilton Colombo recently. The new BMW 6 GT offers supreme driving comfort, coupled with spaciousness and sporting elegance. It features highly advanced equipment, innovative control and assistance systems, and a leap forward in dynamism and efficiency that provide the ideal setting for a relaxing yet exhilarating journey. A combination of intelligent lightweight engineering and increased use of aluminum and high-strength steel grades for body and chassis components, make this first-ever BMW 6 Series Gran Turismo, more agile and safer. More streamlined aerodynamics, more power and greater running efficiency give the car sportier performance while optimizing fuel economy. An exterior length of 5,091 millimetres, a width of 1,902 millimetres and a height of 1,538 millimetres give the first-ever BMW 6 Series Gran Turismo dynamically-stretched proportions. The front end has a distinctive, powerful appearance, with the lenses of the standard Adaptive LED headlights extending all the way to the large BMW kidney grille. BMW’s signature sporting elegance comes to the fore particularly prominently when the car is viewed in profile, thanks to familiar features such as the long bonnet, set-back positioning of the cabin, a wheelbase of 3,070 millimetres, doors with frameless windows, and an elongated window outline stretching deep into the rear end. Rear lights with three dimensional styling add an eye-catching touch. The rear compartment of the first-ever BMW 6 Series Gran Turismo comprise three full-size seats offering maximised legroom. Exhaustive optimisation of the cabin’s packaging sees the first-ever model’s far flatter roofline still translating into extra headroom, while the re-styled rear seat unit and improved soundproofing make it even more comfortable to travel in. The electrically-adjustable comfort seats which come as standard for the rear allow the backrest angle to be altered at the push of a button. The engine of the first-ever BMW 6 Series Gran Turismo has been selected from the latest generation of BMW Group power units and channels its power to the driven wheels via an eight-speed Steptronic transmission. The engine features an aluminium construction, optimised thermodynamics and cutting-edge BMW Twin Power Turbo technology. One four-cylinder petrol engine will be available for the model from launch. The package of technology for the petrol engine is made up of Twin Scroll turbocharging, High Precision Direct Injection, VALVETRONIC fully-variable valve control and Double-VANOS variable camshaft timing. New engine encapsulation reduces noise and accelerates warm-up. The first-ever BMW 6 Series Gran Turismo is equipped with a display and control system offering unrivalled versatility for operating vehicle, navigation, communication and infotainment functions. At the heart of it all is the iDrive system, complete with the Touch Controller on the centre console and the Control Display, now in the form of a freestanding touchscreen. The high resolution display has a screen diagonal of 10.25 inches, while its tile-style menu layout with animated graphics in live mode which facilitates intuitive operation.